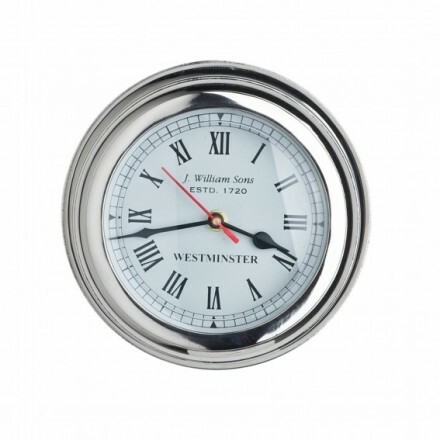 Stylish clock with black hands and a red second hand and roman numerals. Requires a AA battery - not supplied. Depth 10.5 cm, width 21cm, face width 13.5cm. 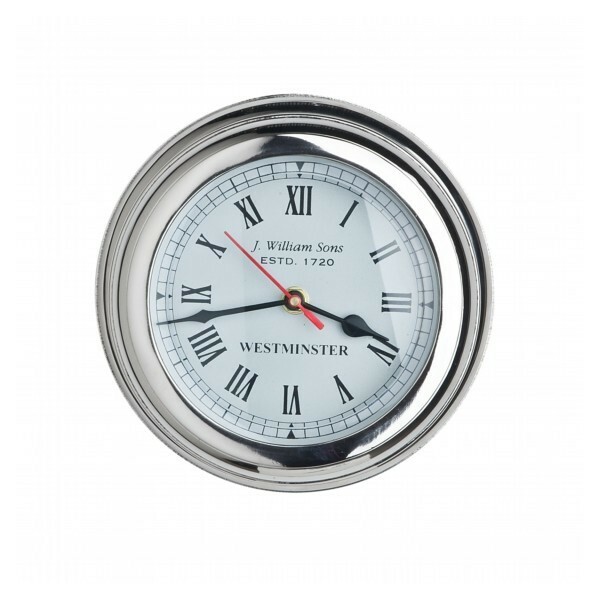 Chunky nautical clock, highyl polished chrome effect, made from cast metal. Fantastic addition to a nautical themed children's room. in keeping with the nautical theme the bevelled glass has a slight blue tinge to it. Solid chunky piece that will look fantastic in any room setting. Depth 10.5 cm,(approx. 4.5 inches) width 21cm, (approx 8 inches) face diameter 13.5cm. (approx. 5 inches).